The individuals who are related to the SEO world, they can observe the rapidly advancing search engines. All because of machine learning as it has revolutionized the way search engines process the ranking. Now with machine learning and other advanced techniques, search engines can focus more on providing the most relevant search results, regarding content as well as far as user experience. User experience is not a new idea for organizations. It was and will dependably be a genuine sign that shows how well your website serves the goals of the visitors and also satisfy your business objectives. The organizations that effectively comprehend what their users want and create experiences that not only furnish them with the desired information as well as in the right format so that they enjoy while browsing information. Also, the kind of browsing experience you give to your users is directly linked to the success of your search engine optimization efforts. User Experience is only a design process of the website which should be managed so that it gives an extraordinary browsing experience to the users. It includes the end-user interaction with the company, its services, and its items. Experts believe that UX is an endless process in light of the fact that your task of improving your product and services will always keep on going. You have to continue changing your website design elements and structural concepts so you can give the best browsing experiences. SEO and UX must work together with the end goal to make a website or a business successful. Let's understand and explore both of them to convert this reality into reality. Google has constantly offered preference to providing the best user experience. It has constantly focused on satisfying the users by giving them the list of best search results. Several technological advancements have made it possible for Google to deliver this vision. It is also expected that its focus will deepen over the coming years. 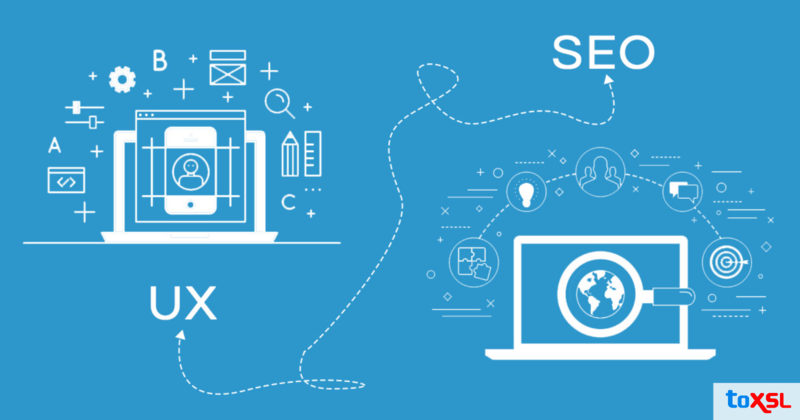 Earlier, UX was not the part of SEO toolbox, but rather now with the change in search engine concepts and SEO strategies, now an SEO expert can talk about UX and furthermore prescribe changes identified with UX based on background, personal experience, and expert development programs. The truth of the matter is that we are moving into a period of search engine optimization, where you have to update your SEO skill sets as search engine optimization techniques are becoming enigmatic. A few innovative technologies like machine learning have been involved in designing the process of search engine ranking results. With all the latest technologies and concepts in SEO, one can without much of a stretch interpret consumer behavior and change their strategies accordingly; which was impractical before. A couple of years prior, UX teams used to consider a linear journey of a website that starts at the home page. However, it was noticed that in reality, less than 50% of the users begin their journey on the home page. This linear approach to UX has not at all given good quality experience to the majority of customers. With the expansion in machine learning, search engine rankings have enhanced a lot with the user signals as a major factor of contribution. It has been discovered that UX issues are preventing organizations from achieving their potential in the organic search results, which could smother performance conversions. There are two different situations which cause customers to leave your website and look somewhere else. First, tabbed content, in which customer arrives on the page relevant to their search, however, the information they are looking for is hidden inside a tab. At the point when there are various scroll pages in which different subtopics exist on a single URL, with no way to land arrive customer on the section that is relevant to their search. UX means giving the best user experience. And the entry of the user should not be limited to the homepage. There should be multiple entry points into a website. By adapting to various entry points, the website's UX will be far better than before and most appropriate to organic search success. Novelty in technology is taking off high as are the users' expectations from it. Technology in simple words is equivalent to sharpening the user's comfort ceaselessly. And this is why, the success of a brand flourishes upon the ease that the concerned UX design is imparting to the user. To conclude, there are no rigid parameters to define UX designing yet the time has come where the companies would keep re-defining the clearly vague UX Design to behoove the majority of the users.